On Christmas Eve, as services concluded in the small log church, the townspeople decided to stay and hold their final town meeting of the year. The only order of business, selecting a new name for the town, was not going very well. Suddenly a gust of wind blew open the door to the church, and sleigh bells were heard in the distance. “Santa Claus!” exclaimed the excited children, providing the inspiration for the town’s new name. 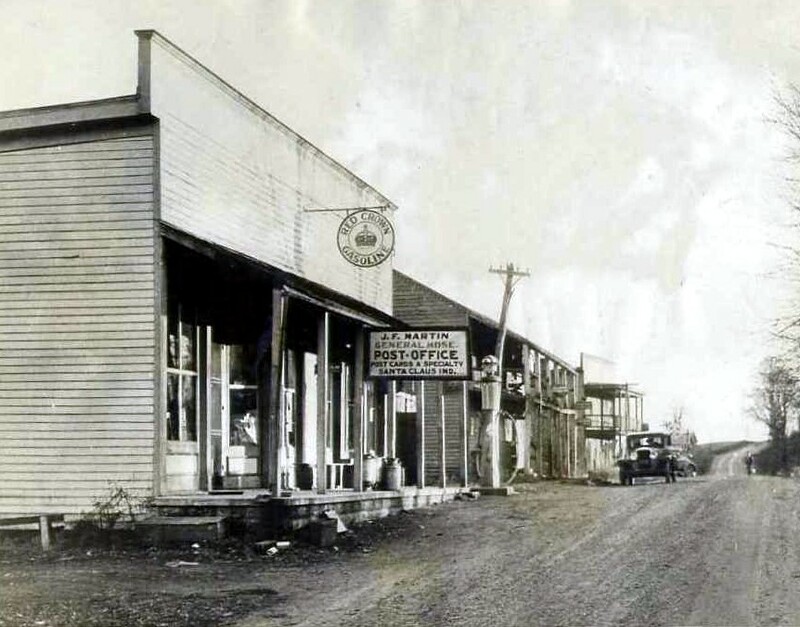 While this heartwarming tale of the town’s inspiration for a new name is not historically documented, it is very well documented that on May 21, 1856, the U.S. Post Office Department approved a post office in the newly-renamed town of Santa Claus, Indiana. The town’s unique name went largely unnoticed until James Martin, who became Postmaster in 1914, began promoting the Santa Claus postmark as a festive way to adorn Christmas cards. He also began answering children’s letters to Santa, a practice that is still carried out by local volunteers in Santa Claus, Indiana to this day. As a result of these efforts, a growing volume of holiday mail began to flow through the otherwise tiny post office each year, ultimately becoming so substantial that it caught the attention of Robert Ripley. In 1929, Ripley featured the town’s post office in his nationally-syndicated “Believe It or Not” newspaper cartoon. The feature thrust Santa Claus, Indiana into the national spotlight and the following Christmas its little post office was flooded with over a million pieces of mail. The town would never be the same again. By 1932, Santa Claus, Indiana’s national fame had caught the attention of a visionary named Milton Harris. Working together with James Martin, Harris dreamed of creating a themed attraction called “Santa Claus Town”, a magical place where Santa would live and work year-round, and where it would be Christmas morning every day of the year. 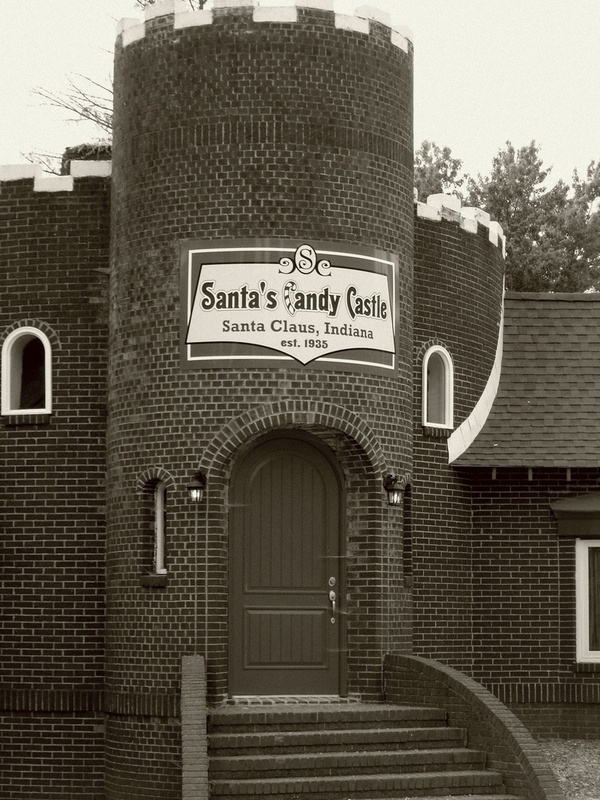 Santa Claus Town was officially launched on December 22, 1935 with the dedication of Santa’s Candy Castle, becoming the nation’s first themed attraction. Other elements of Santa Claus Town included Santa’s Workshop, where Santa and his elves could be seen making toys, and the Toy Village a series of buildings sponsored by American made toy companies where Depression-era children could play with popular toys of the day and have the Christmas morning experience they otherwise wouldn’t have had. 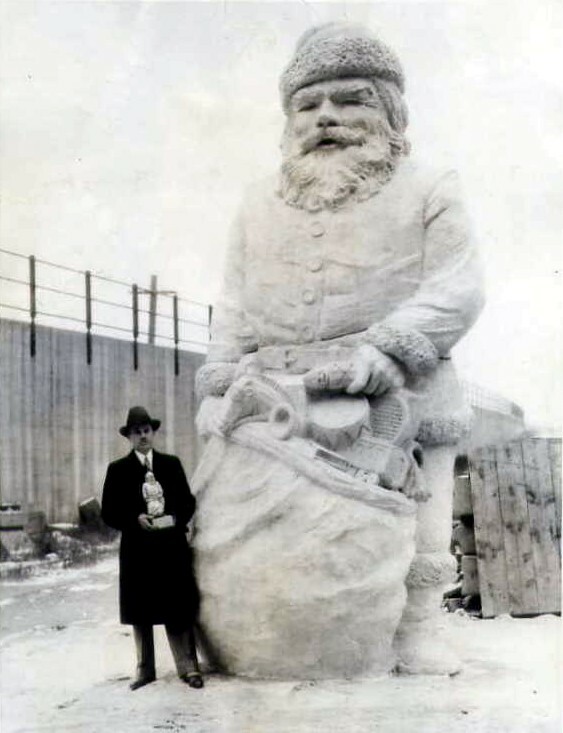 On Christmas Day 1935, Carl Barrett dedicated a 22 foot tall statue of Santa Claus on the highest hill in town. The statue was the centerpiece attraction of Santa Claus Park, the town’s second themed attraction. The statue which was funded through children’s penny donations, is situated on the highest hill in town and rests on a star-shaped platform whose principal point faces east, symbolic of the Christmas Star. A time capsule rests below the statues base. In October of 1938, the town hosted a Santa Claus school. Charles W. Howard was brought in from Albion, New York to teach three separate 3-day courses at Santa Claus Town. A year earlier Howard had developed a course for department store Santas, but only three people attended first school in 1937. Charging a substantial fee of $150.00 per student, the 1938 school in Santa Claus, Indiana boasted ten students at each session and made national headlines. It is at this event that arguably the two most preeminent Santas in history met for the only known time: “Santa” Jim Yellig and "Santa" Charles W. Howard. 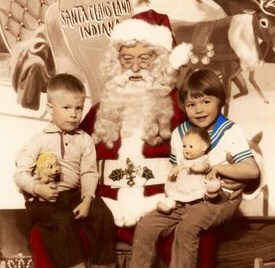 The school still continues in operation today in Michigan, as the oldest Santa school in the world. On August 3rd, 1946, Louis J. Koch opened a new Christmas-themed attraction in town, Santa Claus Land. With early help from his son William (“Bill”), the park would grow steadily over more than six decades of family ownership and operation to become a recognized leader in the amusement park industry, perpetually earning awards as the cleanest and friendliest in the world. Santa Claus Land was renamed Holiday World in 1984 as it expanded to include themed sections of Halloween and Fourth of July. Holiday World has added three major wooden roller coasters that are each ranked among the best in the world: Raven (1995, #10), Legend (2000, #15) and Voyage (2006, #1). In 1993 a water park named Splashin’ Safari was added, which is currently rated as the #2 water park in the world. In 2004, the park received the highest honor in the amusement park industry when it won the 2004-2005 Applause Award. Bill Koch is credited not only with the development of Santa Claus Land, but also with much of Santa Claus, Indiana’s late 20th century development including businesses, housing subdivisions and highway and utility infrastructure. His passing in 2001 left a legacy that will forever live on in the town of Santa Claus, Indiana.